Horse radish is probably the most undervalued wild food. We all know horseradish sauce, but horseradish is extremely common in the wild. It is a plant of roadsides, railway embankments, stream sides and waste ground in general. The photographs below (taken June 28th 2008) show it on the side of the beach approach at East Runton, near Cromer. 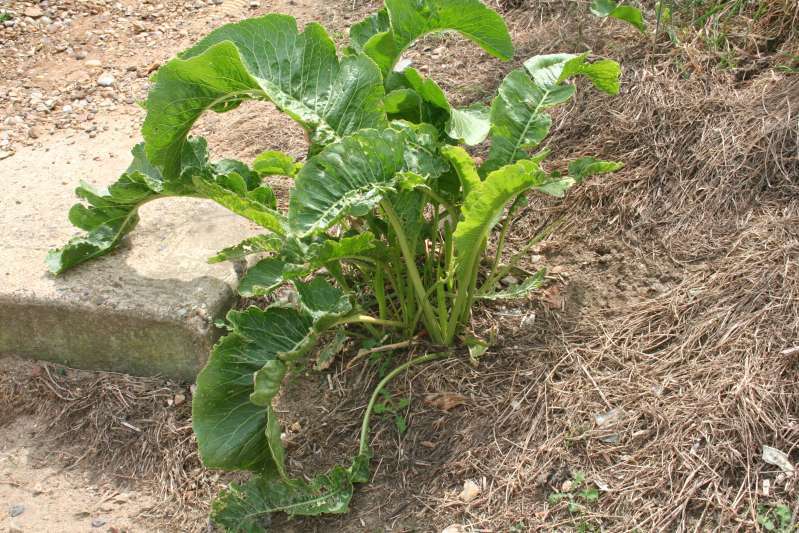 This is a piece of waste ground - a roadside embankment - and the horseradish has been cut down and has regrown. It's a very vigorous plant, difficult to kill except by frewuent mowing. The photos are not of a pristine specimen, more typically the sort of plant you may see! 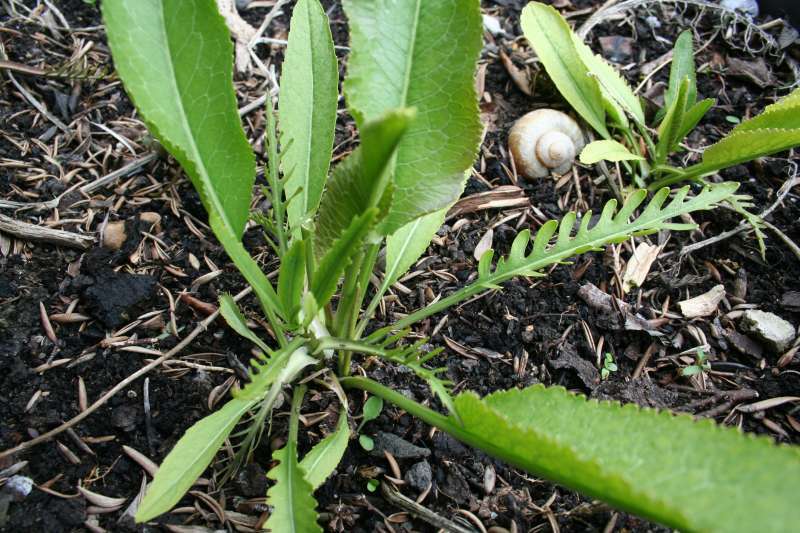 Horseradish is a perennial - the roots over-winter and growth starts in early spring, when the plant is not very evident unless you know where to look and what to look for. Photos 2 and 3 show the young new growth with their distinctive shape. These photos taken in our garden in Burwell, 2012, April 5. Later the leaves mature, looking very similar to a dock. However it's easy to distinguish them as the crushed young leaves give off an unmistakable odour. As the year progresses the leaves become more evident and not so easy to distinguish by smell. The plant flowers in June. 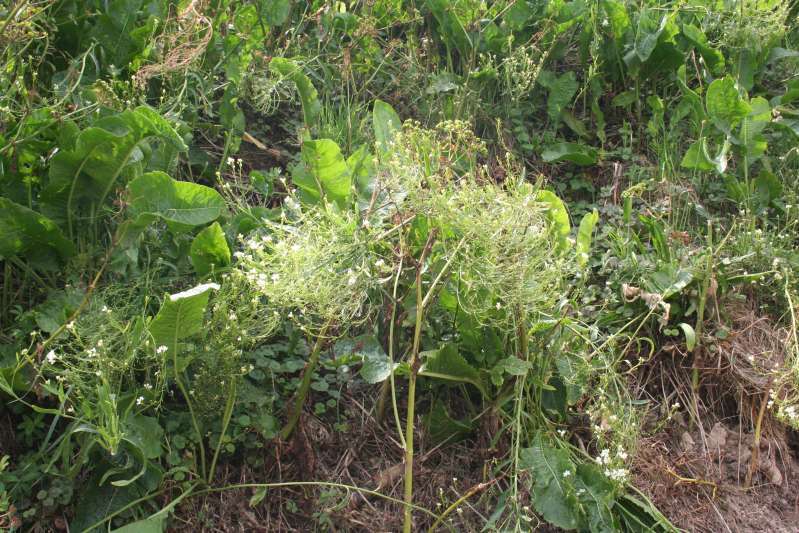 The main problem with harvesting wild horse radish root is that it tends to be growing in waste ground - which is usually stony! So it can be very difficult to dig out. If you manage to find a supply in nice soil, the roots can go very deep, and they are also not usually straight, even when not deflected by stones in the ground. The plant, now so common in England probably originated in southern Russia and was introduced for culinary purposes. 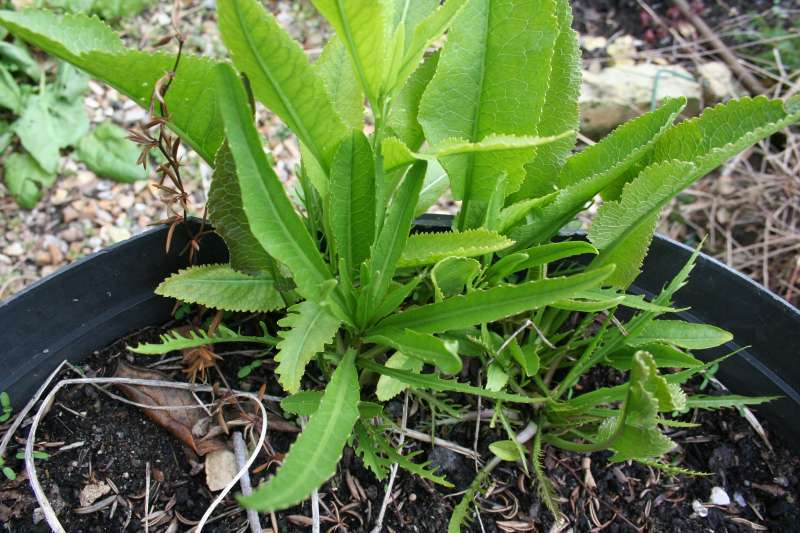 Not only is the root very versatile, but the young leaves can also be added to salads. In fact it is not only the young leaves that are useful ibn salads: even a rather older leaf can be quite palatable, cut fairly fine. Very old leaves tend to get bitter. Leaf flavour is strong, though not as pungent as the roots, so you will not need a lot! Plants for a Future on horse radish.